Leamon Troy SPEARS [Parents] was born about 1936. Leamon married Betty. Betty. Betty married Leamon Troy SPEARS. Earl CAUDLE was born about 1936. Earl married Peggy Lee SPEARS. Peggy Lee SPEARS [Parents] was born about 1938. Peggy married Earl CAUDLE. David IRBY. David married Judy LaVonne NORRID. Judy LaVonne NORRID [Parents]. Judy married David IRBY. Kenneth Ray SPEARS [Parents] was born on 11 Jan 1937 in Beaver Mountain, Haskell, Oklahoma. Kenneth married Janice. Janice. Janice married Kenneth Ray SPEARS. Lawrence ARNOLD. Lawrence married Susan J. TUCKER. Susan J. TUCKER was born on 2 Aug 1864 in , Clark, Arkansas. Susan married Lawrence ARNOLD. F i Lucinda ARNOLD was born on 2 Jun 1882. She died on 19 Aug 1951. James Hershel WEATHERFORD [Parents] was born on 13 Mar 1920 in Bonnerdale, Hot Spring, Arkansas. He died on 25 Jan 2007 in Bonnerdale, Hot Spring, Arkansas. James married Mary Ellen Irene SORRELS..
Mary Ellen Irene SORRELS. was born on 8 Jul 1924 in Lucky, , Arkansas. She died on 26 Mar 2007 in Bonnerdale, Hot Spring, Arkansas. Mary married James Hershel WEATHERFORD. John Lewis JONES [Parents] was born on 3 Oct 1862 in Amity, Clark, Arkansas. He died in Holly Creek Community, McCurtain, Oklahoma. John married Nancy E. WEATHERFORD on 13 Nov 1884 in , Clark, Arkansas. Nancy E. WEATHERFORD [Parents] was born on 10 Aug 1866 in Arkansas City, Deshea, Arkansas. She died on 11 Mar 1943 in Holly Creek Community, McCurtain, Oklahoma. She was buried in Holly Creek Cemetery, Holly Creek, McCurtain, Oklahoma. Nancy married John Lewis JONES on 13 Nov 1884 in , Clark, Arkansas. M i John Pruitt JONES was born on 8 Apr 1886. He died on 29 Dec 1969. Newt JONES was born in 1888. Susie JONES was born in 1889. Rosalie JONES was born in 1890. 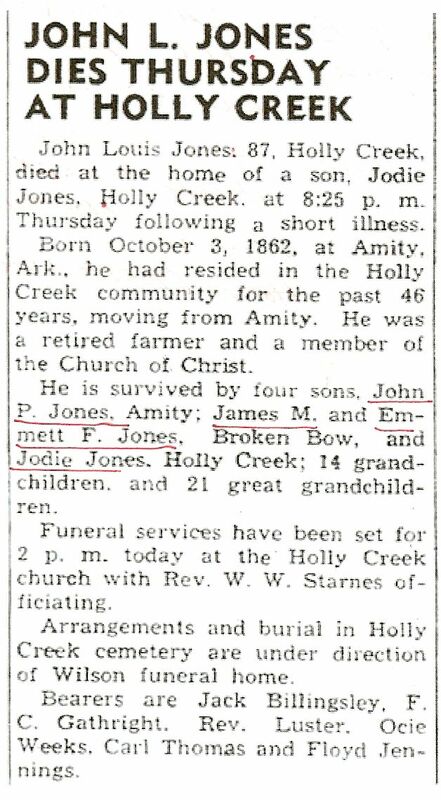 James M. JONES was born in Jul 1892 in Amity, Clark, Arkansas. M vi Emmitt Frank JONES was born on 20 May 1897. He died on 2 May 1959. Jody D. JONES was born in Aug 1899 in Amity, Clark, Arkansas. Emmitt Frank JONES [Parents] was born on 20 May 1897 in Amity, Clark, Arkansas. He died on 2 May 1959 in McCurtain Memorial Hospital, Idabel, McCurtain, Oklahoma. He was buried in Holly Creek Cemetery, Holly Creek, McCurtain, Oklahoma. Emmitt married Vera Mae SCARBROUGH. Vera Mae SCARBROUGH [Parents] was born about 1898. Vera married Emmitt Frank JONES. Joe Donald JONES was born in Abr 1817. David Frank JONES was born about 1819. Jimmy Ray JONES was born about 1821. Shirley Ann JONES was born about 1823. Mary Ellen JONES was born about 1824. William Joseph SCARBROUGH. William married Hattie Mae WATKINS. Hattie Mae WATKINS. Hattie married William Joseph SCARBROUGH. F i Vera Mae SCARBROUGH was born about 1898. Robert Lee MAYABB was born on 28 Feb 1865 in , , Virginia. He died on 1 Apr 1941. Robert married Eliza Louise WEATHERFORD. Eliza Louise WEATHERFORD [Parents] was born on 4 Oct 1871 in Bonnerdale, Hot Spring, Arkansas. She died on 4 Jan 1957. Eliza married Robert Lee MAYABB. Rose MAYABB was born in 1892. M ii John Luther MAYABB was born in 1892. He died on 28 Jan 1983. F iii Mary Lee MAYABB was born on 28 Oct 1894. She died on 8 Feb 1971.